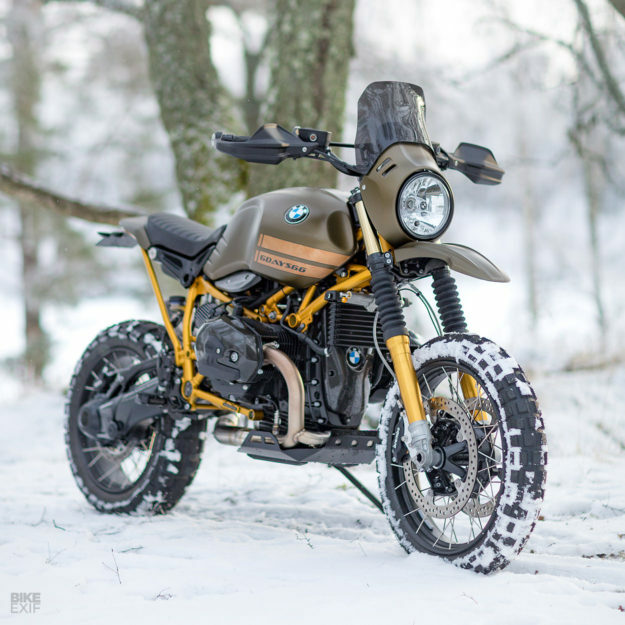 There are five BMW R nineT models you can buy today, and the Urban G/S is my favorite. It’s a clever hat-tip to the legendary R 80 G/S, and it’s a total hoot to ride. 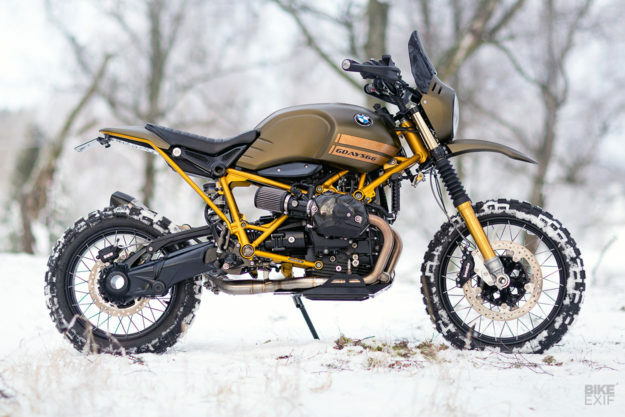 But unlike the 1980s classic it’s modeled after, the Urban G/S isn’t really an off-roader. It’ll tackle the odd fire road for sure, but it’s not designed to handle the rough stuff. 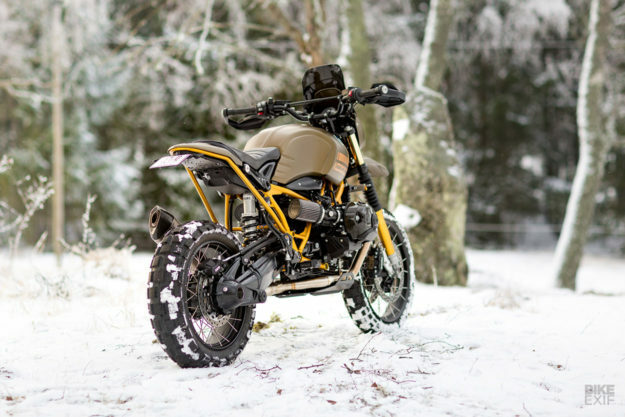 If you love the R nineT and want to go off-piste, you’ll need a custom build—like this toughened up beast from Ronna Norén of Unique Custom Cycles. 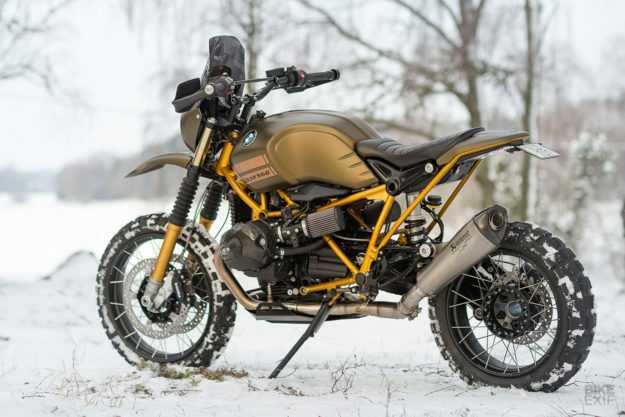 This R nineT landed on Ronna’s bench via BMW Motorrad Sweden. 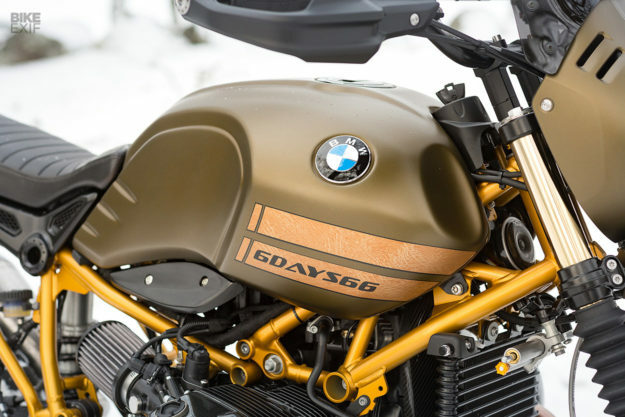 They’ve collaborated before, with a slick nineT café that ticked a lot boxes for a lot of people. So they figured it was time for another project together. Unfortunately, the bike needed to be ready for the Swedish motorcycle show in Gothenburg—giving Ronna a mere three weeks to work his magic. He’s not one for doing things in half measures though, so there are no shortcuts. He hit the ground running. 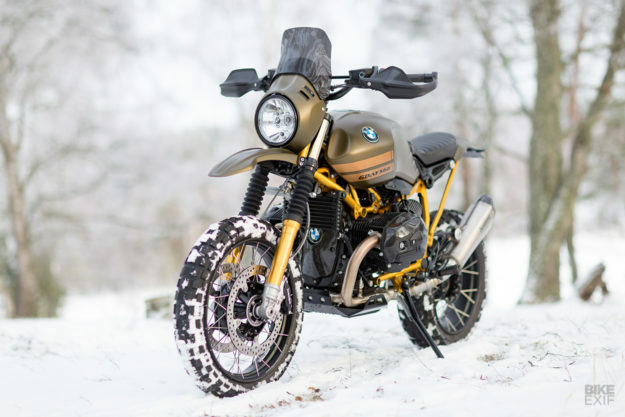 Up top, he swapped out the Urban G/S’s red two-up perch for the 1½-length unit from the R nineT Scrambler. 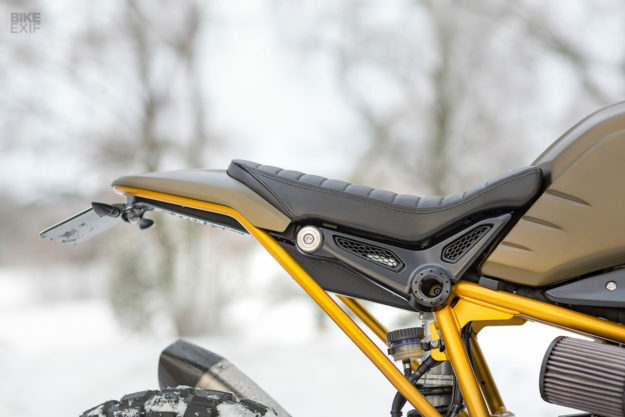 “I thought it would look great on the Urban, and give it a sportier and lighter look in the rear,” he says. He then ditched the nineT’s stock removable subframe, preferring to fabricate his own with a loop to follow the shape of the tail. The main frame was detabbed once the airbox was ripped out, and the electrics relocated to a discreet tray under the seat. The engine now breathes through a pair of chunky K&N filters. 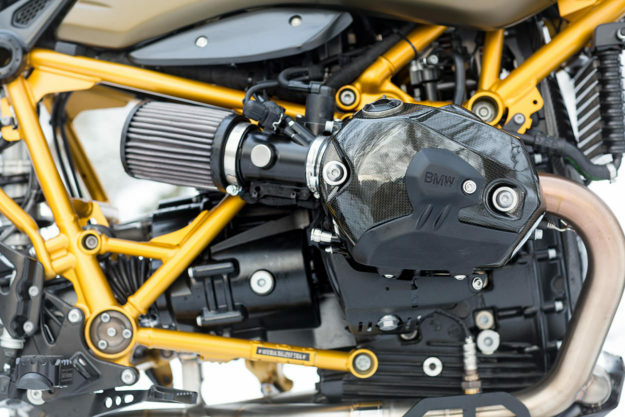 But tossing the airbox also meant losing the intake that sits on the right of the nineT’s tank. It left the tank looking a bit lopsided, so Ronna cut and shut the right side to match the left. The Urban G/S’s optional 19F/17R cross-spoked wheels were just the ticket for fitting chunky rubber to. But Ronna knew he’d need to jack up the suspension if he wanted respectable ground clearance. So he put in a call to his countrymen at Öhlins. They hooked him up with a Retro43 fork and an STX46 rear shock. That raised the bike by 50 mm in the front and 75 mm in the rear, leveling out the nineT’s stance nicely—and giving it the tall demeanor Ronna was after. To get the new forks to fit, Ronna called up his brother Benna, who runs Tolle Engineering. Benna is very handy with fabrication, and whipped up a 28 mm ‘dropdown’ triple. As well as fitting the new forks, it holds a set of adjustable KTM risers. They’re wearing a set of cross-braced bars complete with BMW hand guards. Up front, Ronna trimmed the stock fender, and fitted a Wunderlich screen to the classic nose fairing. 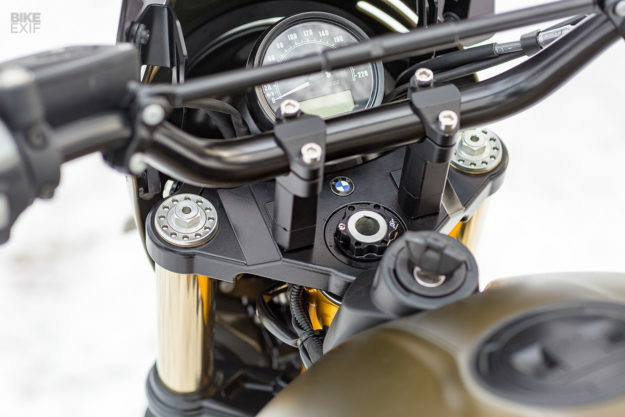 Well-selected aftermarket parts raise the spec even further: grippy foot pegs from Gilles Tooling, a Hepco & Becker skidplate, and a carbon engine breast plate and valve covers from BMW’s own HP catalogue. The exhaust is a full stainless and titanium system from Akrapovič. But the real star here is that incredible paint job. It was executed by Håkan Lindberg, and holds a lot more detail than you’d think. Håkan settled on satin finishes all round, applying a gold candy with a matt clear coat to the frame to match the Öhlins fork. For the bodywork, he mixed up a secret brew of brown metallic and gold candy, to create a unique olive that flips when the sun hits it. 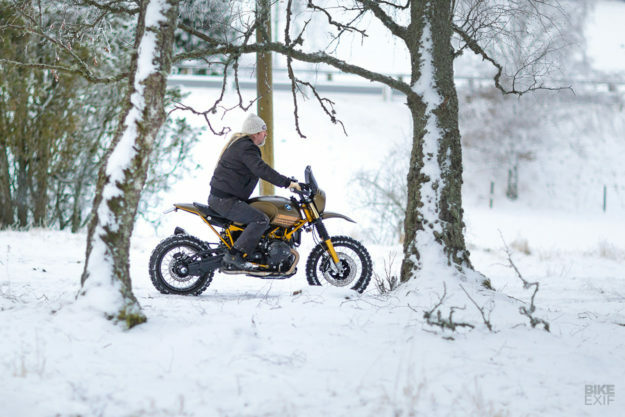 It’s a nod to local BMW legend Bo Rindar, who piloted a boxer for the BMW factory team in the 1966 International Six Days Trial—which was held in Sweden that year. With the photos in the bag, Ronna packed up the Urban G/S and immediately hauled it to Gothenburg for its unveiling. Mission accomplished, and just in time.